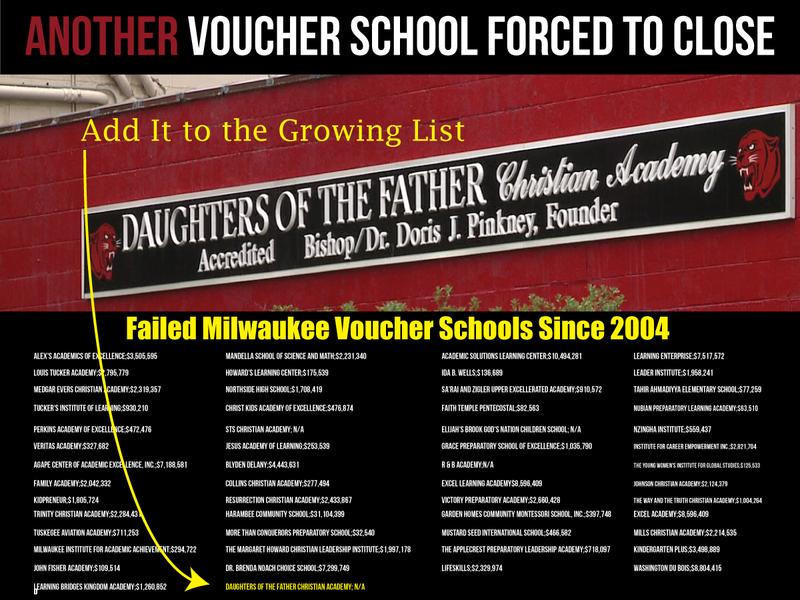 Daughter’s of the Father Christian Academy voucher school just abruptly closed its doors nine days into the school year making it 50+ Milwaukee voucher schools to be forced to close since 2004. Whether they have not met requirements related to finances, accreditation, student safety, or auditing every one of these schools didn’t serve the best interests of students and taxpayers. These failed voucher schools have hurt countless students and families as well as have cost Wisconsin taxpayers $139 million dollars in that time. Isn’t it time we pull the plug on this failed experiment called voucher schools? Private schools that received state vouchers but were subsequently barred from participation in the program.